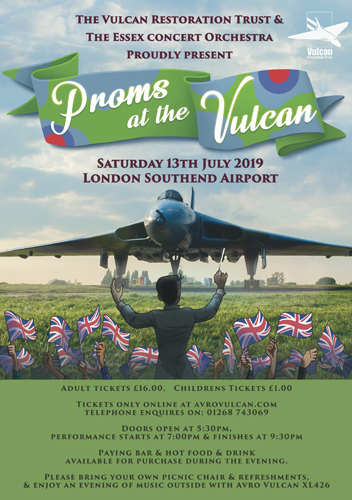 'Proms at the Vulcan' is a new and exciting event which will see the Essex Concert Orchestra performing a selection of popular movie and classical music alongside Vulcan XL426 at London Southend Airport. The orchestra comprises some of Essex's top musicians and includes professional musicians, students at prominent London and Essex music colleges, and local music teachers. It is a member of Southend-on-Sea Arts Council and performs at venues across Essex and further afield. The orchestra will be joined by a soprano soloist for its performance at 'Proms at the Vulcan'. Gates will open at 5.30 pm and the orchestra will begin playing at 7.00 pm. The concert is scheduled to finish at 9.30 pm. The seating area will be outside with the orchestra on stage just inside the Vulcan Restoration Trust hangar. No seating will be provided so please bring your own chair or chairs. Refreshments, including hot and cold food, will be on sale throughout the evening but you are welcome to bring your own picnic if you wish. There will be a licensed bar. Vulcan XL426's cockpit will be open to visitors from 5.30 pm until the start of the concert. Cockpit visits cost £5.00 per person and will be subject to availability on the evening. Vulcan souvenirs will also be on sale. Under-16s: £1.00 "Kids for a Quid"
Admission is by advance ticket only - there will be no tickets on sale on the evening. We look forward to seeing you for an enjoyable evening of live orchestral music alongside Vulcan XL426 at 'Proms at the Vulcan'.